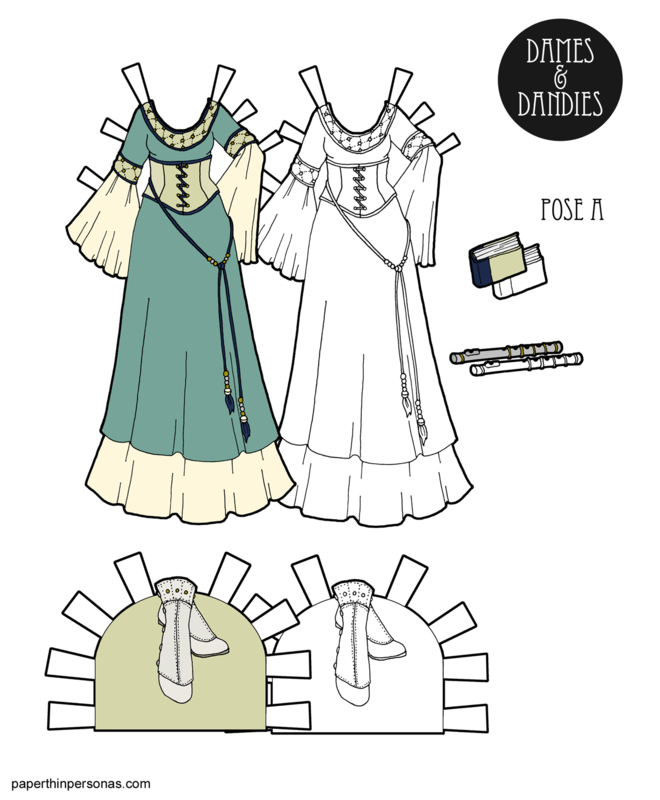 The first paper doll outfits I drew for the Jewels and Gemstones were fantasy gowns. This was one of them. The other, I’ll be sharing on Friday for my Patrons. I tend to return to these sorts of medieval inspired fantasy gowns when I don’t know what to draw. I don’t know why, exactly, but it’s a style I like and a style that doesn’t take a lot of thought for me. I think? There are things like these sorts of gowns (another example, and another, and another) that are simple and I can draw without having to look at lots of source images or worry about historical accuracy. The paper doll equivalent of that recipe you make over and over again, because you know it will come out. Maybe not super innovative, but comforting. The pumpkin bread of paper doll clothing. 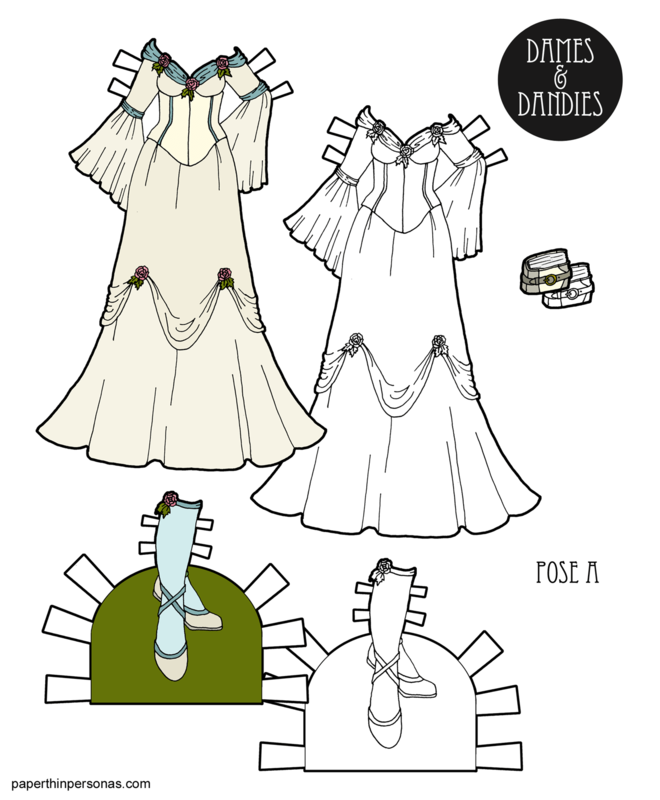 Today’s paper doll gown lacks a real specific inspiration. Medieval clothing, I suppose, but only in a fantasy universe sort of way. Specific Source Images: I haven’t got any this time. I almost called this set “Purple Princess”, but I felt weird doing that, because there’s also a black and white version. Did you know there are weekly process posts on Patreon? And monthly paper dolls and weekly paper dolls? Consider joining here. First off 14th Century week continues with today’s surcoat over a kirtle and some headdresses. Second off Happy Thanksgiving to those who celebrated yesterday. Surcoats were worn over kirtles (I did one of those on Wednesday). Like a lot of surcoats, today’s has slits in the front that provided access to the purse worn off the girdle underneath. Think of it as the 14th century solution to pockets. 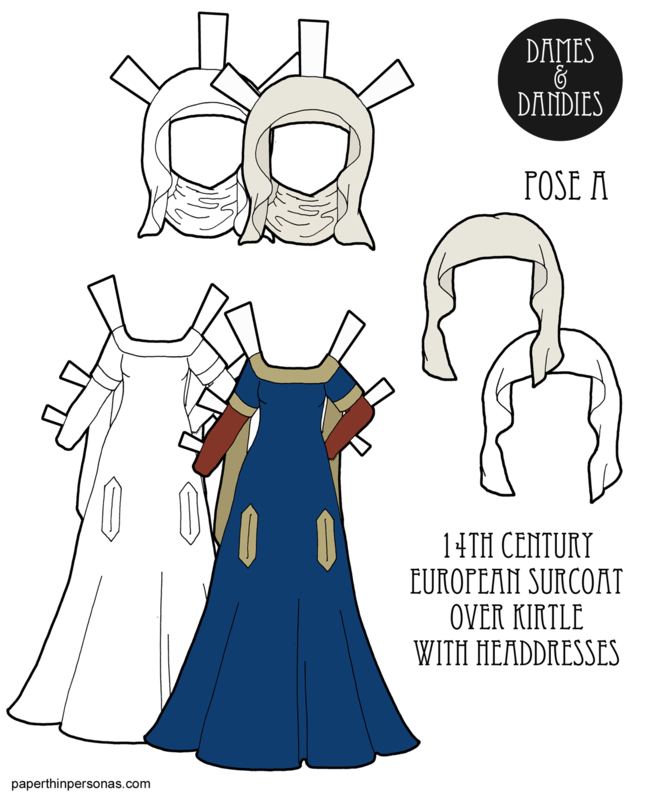 Today’s paper doll surcoat with kirtle was inspired by the Romance of Alexander from the Bodleian Library MS. Bodl. 264. There’s a bunch of different examples of this short sleeved surcoat in there, but I based this dress off the red dress in this miniature and the blue dress (and pink dress) in this miniature. One of the interesting things about those miniatures and many others from this era (check out my 14th Century Dress Pinterest board for more) is how many of them show women with their hair uncovered. Unlike later eras (and some earlier ones) the 14th century seems to be a time when women could go around without covering their hair. However, some women did still cover their hair. Here’s one miniature with some hair covered and here’s another and here’s a third one. You also see head coverings in statuary. One thing I do when I am trying to decide what to include in these historical sets is to try to find multiple examples of something. That’s why you see some duplication of types of images on my 14th Century Dress Pinterest board. That’s also why when I am dealing with an era I don’t know much about it can take me a long long time before I am comfortable drawing a paper doll of it. I learned a lot of history from Tom Tierney’s historical paper dolls and I want mine to be as helpful and accurate as I can make them. 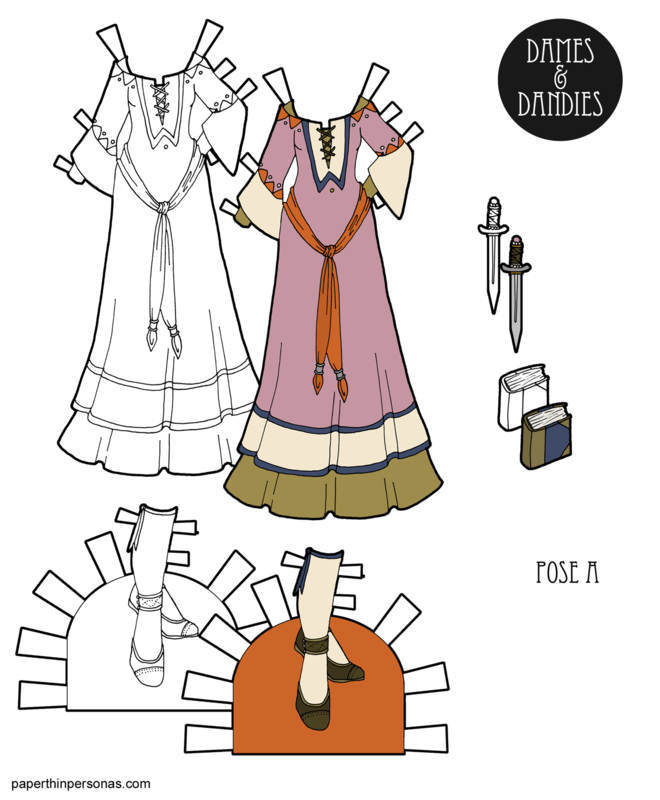 If you want some say in the time periods I create paper dolls for, think about supporting the blog on Patreon. I tend to listen to my Patrons when they make requests. Here’s a post about what patrons have made possible from earlier this week. Have you enjoyed 14th Century week? Let me know. I love to hear from you. 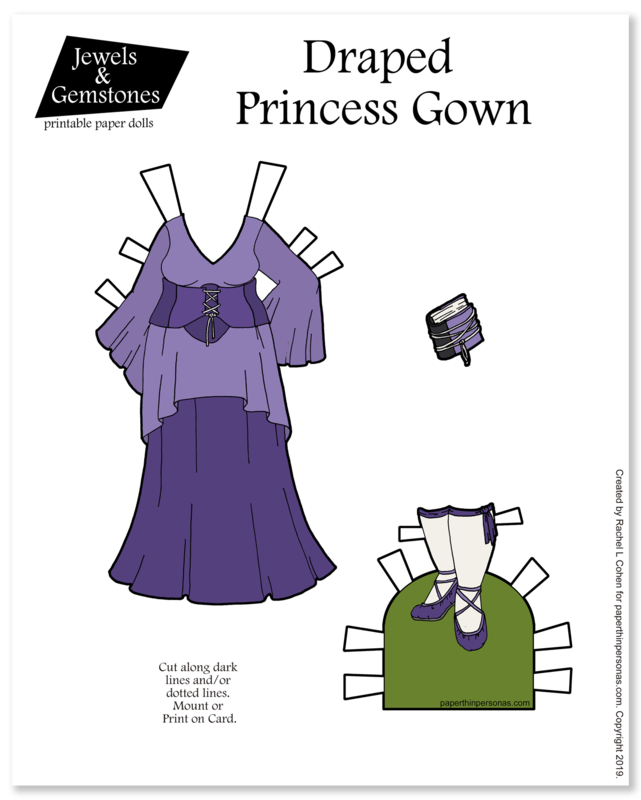 Printable Black & White PDF Printable Color PDF More Paper Dolls & ClothesToday’s paper doll gown is a new addition to the Fantasy Maiden Series. I really wanted something that felt soft and drapy to contrast with the corset over top of it. In my continuing efforts to come up with medieval fantasy style accessories that made sense, I gave her a primitive looking embroidery frame. The color scheme of today’s dress was inspired by the sunset. I wanted it to be rich and warm, which I think I worked pretty well. I wanted to thank the folks (there were a few) who emailed me after last week’s foray into coloring pages. Your emails were super kind. Thank you! And I learned things about people who like to color. I always love to hear from folks and it is kind emails that keep me going when I get full of ennui. Ennui does happen occasionally. Fortunately not as much ennui as I felt when I was 14 and thought that “Darkened Shards” was a totally rational name for a paper doll website. I am not making this up- I really did have a site named that. A few folks asked about my pets, so if you want to see my cat, she is occasionally featured on my Instagram feed which is also full of sketchbook photos, little videos of me inking and other fun stuff. 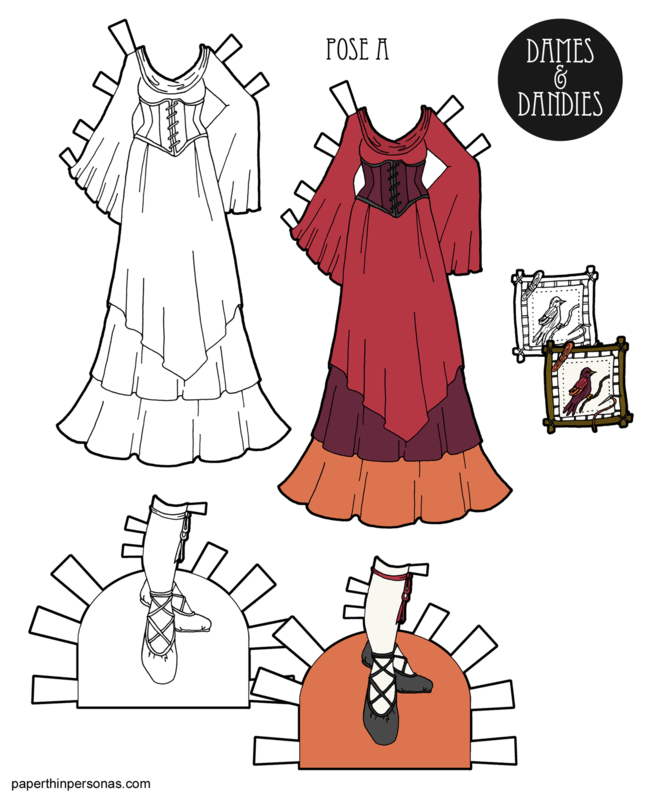 And if you’re a Patron (or become one), there’s a second purple based color scheme for today’s paper doll gown over there. Printable Black & White PDF Printable Color PDF More Paper Dolls & ClothesNormally, the last Friday in the month is my paper doll collab day, but because of “life” we all agreed to move the usual sharing of the collaborative paper doll project to Monday. So, be sure to tune back, so to speak, for that. Today, instead, there is a new addition to the Fantasy Maiden Series. As some of you may recall, I introduced this series back on the 6th of July. Today’s addition to the Fantasy Maiden Series is a more formal down than my last one. I think perhaps something meant for an event or maybe a banquet. I also imagine it as being made of velvet and silk, but, of course, you may decide yourself what fabrics are in use. I didn’t want to draw yet another sword/dagger (which is my default medieval accessory), so instead I drew a book of music and a flute. I’m not very musical myself, but I like to think my paper dolls have all sorts of talents that I don’t possess. One of my personal challenges with this color scheme was not to use any black at all. Instead, I used a deep navy to accent the other shades which I think gives a sort of seaside or mist filled morning feel to the gown. If you want to help keep the blog on the internet and ad free, than consider joining the Patreon page. For my patrons, there is an alternative color scheme in reds and purples. I’m retroactively adding the first medieval fantasy gown I drew to the collection. I probably should draw some crowns if I want to consider this a medieval princess gown rather than just a medieval fantasy gown. I always forget to draw my princesses crowns. I should get on that. Maybe for another set. Today’s gown was inspired the allique designs I often draw on tunics when I’m drawing fantasy men’s clothing- examples include this paper doll set, this paper doll set or this paper doll set. The color scheme was born out of a desire to steer clear of the primary colors I usually use and instead dabble in secondary colors- hence the orange, purple, and green accents with the pink base. I’m quite pleased with this dress in part, because I don’t think it looks like much I have ever drawn before. The shape of the neckline and shorter flared sleeves are both different from many of my other medieval inspired fantasy gowns. What do you think? Excited about this new collection?